William Chadwick Holder, known to most as Chad, was born on May 6, 1977. He grew up in the Ford City/Little Hatton Community of Colbert County, and graduated from Colbert County High School in 1995. He graduated from Jefferson State Community College in 1997. Chad began working at Morrison Funeral Home in 1994, and currently serves there as a manager. Chad and Kelly (Ryan) were married in 1998. They reside in Muscle Shoals, and have three children, Ethan (2001), Emily (2003), and Ella (2007). Chad was saved in 1999 and called to ministry the same year. Licensed in 2001, and Ordained in 2005, he has served in various capacities, including Youth Minister, Associate Pastor, Education Minister, Missions Minister, Administration Minister, Interim Pastor, and Pastor. While serving, he's been able to share Christ with people locally, in various parts of the United States, and in countries in Europe, Asia, and South and Central America. 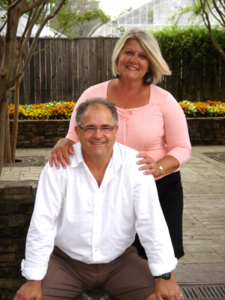 David and Natalie Askew, Children – Esther, Vera, and Abram - Lives in Florence, Alabama. Seth and Lindsey Warren, Children – Charlie Mae & Scout - Lives in Tuscaloosa, AL. Favorite Musical Instrument – Piano/Keyboard, I have a full cd of ten original songs I recorded in Nashville Tenn. a few years back and I share those wherever I can. Conversion – I accepted Christ at 11 years old and surrendered to the ministry at 21 years of age. I was in student ministry for 25 years before going totally into worship ministry. We have served in churches from coast to coast, California to North Carolina. I love the people of York Terrace Baptist Church and believe God will use this church to reach the entire area for Christ. I am thankful to be on staff at York Terrace. Bailey Ellis is serving as the Children's Minister for York Terrace Baptist Church. Bailey is married to Kyle Ellis, manager of the LifeWay Christian store in Florence, AL. They have been married seven years and have two children, Cecelia and Bennett. Originally from South Alabama, she moved here to attend the University of North Alabama. She has a bachelor's degree in Secondary English Education and taught ninth and tenth grade until she chose to be at home when her daughter was born. Bailey was saved at the age of seven and has been trying to serve the Lord faithfully ever since. She has been attending church all her life and has served in churches working with children and teens for nine years. Just this year she surrendered to the call of vocational ministry.